with the new KHIII game i just had a thought and just wondered it anyone had any theories on it asides me. Wanna Anime Figurine??? A chance to be a Moderator? And the one who looks like Sora/Roxas 'dies' any way! these guys have nothing to do with sora as far as the amout of info released has offered to tell us. sora even fights Terra in KHII FM+.and all they guy says is stuff about the keyblade and Xeohnart<Sp? I thought Sora's mom was calling to him in the first game ?? yeah... he doesnt really care too much about his parents though... funny that. "Riku! Kairi!" Doesn't he have other friends??? wow, i never thought my theory of the parents would... crash and burn like that. Need to watch more Final Mix clips. I always thought Terra looked awsome! SanaxikaXX wrote: wow, i never thought my theory of the parents would... crash and burn like that. Need to watch more Final Mix clips. Yes but don't worry! Look for birth by sleep on you tube... I'v egot a new vid hopefully coming up soon! Silent Fantasy wrote: I always thought Terra looked awsome! but I'm still keeping my theory that Terra, Aqua and Ven have at least a relationship with Sora, Kairi and Riku because there could be NO WAY (in my opinion) that both Roxas and Ven look alike just by coincidence! thats true.im waiting to see what that reason is too. Maybe a distant relative or something...? Axika wrote: Maybe a distant relative or something...? Well when birth by sleep comes out we'll know! 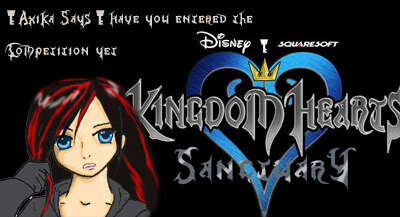 Axika wrote: Well when birth by sleep comes out we'll know! damn rihgt! when it comes out,im jumping to the stores. Same... even if I don't have a PSP or DS by then! just wondering, does anyone else have a theory upon KH3? yes.there most likely wont be one.